I am going to keep this blog entry short and sweet, since I know I am SUPER behind in posting, I want to crank some out tonight while I have the time! This recipe came from Creme de la Crumb and I would highly recommend it if you’re looking for a new (or first) sweet potato fry recipe! Feel free to also poke around her blog for other delicious-looking recipes! Also, I paired it with simple pre-made hamburger patties (I have never bought the pre-made ones myself, cuz I like to mix in my own spices and marinades, but they were in the freezer), so it was a perfect pair! 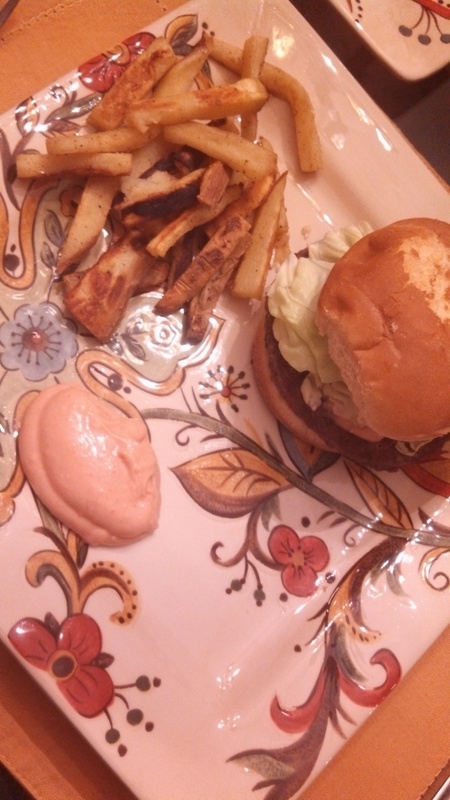 Side note: I *definitely* added sriracha sauce to my fry sauce!! -Preheat oven to 450. Cut the potatoes in half, length-wise, then cut again, to make traditional “fry” shapes (check my pix or the pix on the original blogger’s page). Place the potatoes in a bowl and toss with olive oil. -In a smaller bowl, mix all the seasonings together. Sprinkle and mix them into the potato bowl, then spread onto a baking sheet. -Bake for 10 minutes per side (20 total). 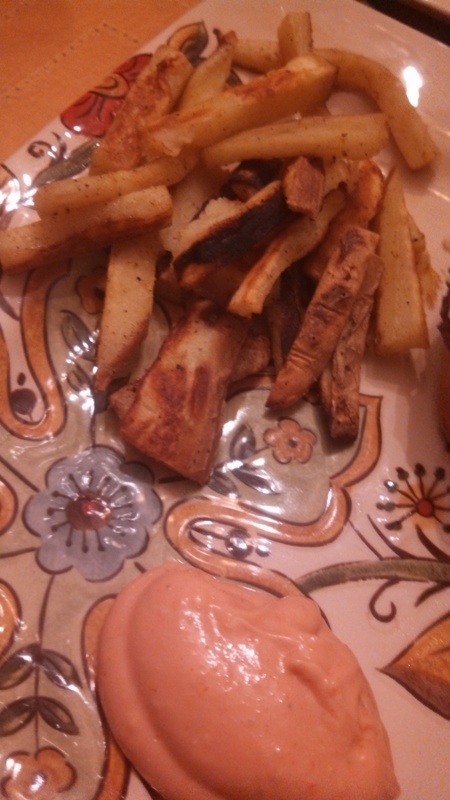 While baking, mix together all of the ingredients for the fry sauce.